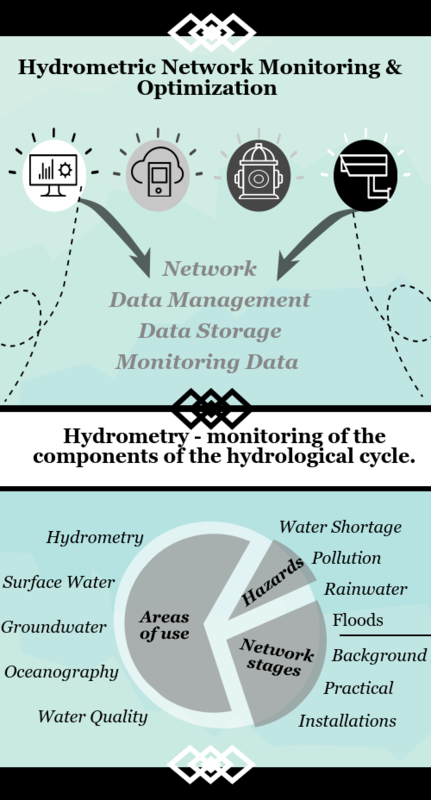 A hydrometric network is composed of a group of different stations which are designed and operated explicitly to do monitoring ground and underground water by using special observation programs and methods. Information collected from the network’s observation process can be used, for example, for a water resources assessment, for plan development, project design, for designing flood protection measures including flood forecasting, to control water exploitation and many other problems. 1. UIZ offers to optimize hydrological networks, while the process itself is slow, and requires the involvement of the first class experts. The water network starting with a minimum number of stations and increasing gradually until an optimum network is attained. During this process of water network creation, control is the main factor. Control in the system is enabled only by the technology. UIZ R&D Team developed web-based GIS software that found wide implementation in this field. 2. One of the most important aspects of this service is the possibility to facilitate the management of the data, to centralize the hydrometric data storage. On the other hand, data storage is not the only aspect that can be centralized: run from a single station. The overall system’s centralization is the key to success. Our experts can be extremely helpful to overcome these obstacles. 3. Our Water Management Research Team will help our client in the overall process of hydrometric network monitoring, including teaching how technology can be used in water management and monitoring, present the newest methods and methodologies developed for this purposes, and even the consulting on the project in any water-related field. We have predicted that technology will improve the general water situation because of the wide technology usage in hydrometric data processes, where information can be processed faster, and the forecasts can be summarized: any water problem can be solved before even ever occurred. Changes made to optimize efficiencies and maximize effectiveness in the delivery of critical hydrologic data products and services will ensure the success of mega ­projects, the preservation of vital ecosystems, and the safety of citizens. Improvements in water data inter­operability and accessibility will support evidence-based decision-making for water related problems from the scale of culvert design up to global environmental policy-making that will ultimately make the world a better place for generations to come. For more information, please, contact us !